The first 50 pages of this oversized, spiral-bound book are filled with fly-tying techniques, the last 150 pages are cut horizontally across the page. The top half of the page shows the tying steps for 100+ of todays best patterns, and includes references to techniques that are explained and pictured in the bottom half. 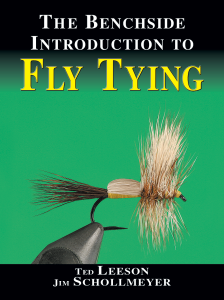 This unique format allows detailed instructions on each specific step / technique required to tie each fly–more then 100 patterns in all presented step-by-step! Spiral-Hardcover, 1500+ color photos; 9x12 inches, 189 pgs.